Not in the futureâ€”but right nowâ€”scientists are putting to work the limitless energy of the sun. SOON, a native of East Punjab, India, will walk into the local version of the neighborhood hardware emporium, plunk down 80 rupees and buy a newfangled kind of stove. Back home, he’ll proudly unwrap the shiny gadget, set it up and tell his wife to start dinner. Less than an hour later, she’ll call out the Indian equivalent of “Come and get it!” and the family will sit down to a mealâ€”a meal cooked by sunshine in the world’s first mass-produced solar stove! This initial Solar Cookerâ€”a device simple to operate, easy to maintain and economical to useâ€”is actually in production in India right now and is just about ready to go on the market. 1. This and other recent forward strides in solar energyâ€”the harnessing of the sun’s limitless power for the needs of manâ€”now open for the first time exciting commercial possibilities. 2. Despite what you may have thought, sun power is no longer a phantom, will-o’-the-wisp notion chased vainly by a few starry-eyed inventors. It is actually here! Let’s dig a bit deeper into the opportunity aspect. What else is coming? “Small cooling units utilizing the sun’s energy are also feasible,” said Dr. Telkes. And still a third foreseeable application, she asserted, lies in development of small-scale thermo-electric generators for household purposes. A fourth possibility is the use of the sun to convert sea water to fresh water for human consumption and irrigation purposes, thus opening up vast new areas to habitation and cultivation. Let’s look now at what’s actually going on in solar energy. Enormous work costing huge sums still remains to be done, of course. But the really big story is that scientists, working in many dozens of university laboratories and research foundations throughout the world, have finally struck pay dirt. They have made the first significant beginnings and learned some of the precious secrets of capturing energy from Old Sol. Take the Solar Cooker which is on the production lines in teeming India. It was developed by that nation’s National Physical Laboratory after years of research and permission has been granted to a firm called The Jeevanlal Limited in Calcutta to produce it on a mass scale. The stove consists of an aluminum sheet about four feet wide which is pressed into a concave shape and is brilliantly polished to reflect the sun, acting as a lens to gather heat. In the center of this mirror is an opening from which protrudes an attachment to hold a “burner” on which a cooking utensil is placed. The mirror is supported on a cast iron frame and can be revolved in the direction of the sun to extract the maximum possible heat. The cooker itself is designed to serve a family of five, weighs only 30 pounds and has the heating capacity of a 400-watt electric oven. Researchers who conducted numerous tests in all sections of India discovered that vegetables could be done to a turn in 25 minutes in sunlight of 105Â° F. Rice required 33 minutes. They found, too, that in dry regions such as East Punjab, Madhya Pradesh and the deserts, the stove can be used for fully 310 days of the year. Because of some wet and foggy intervals, it can be put to use slightly less in Bombay and parts of South India, but even then the natives can cook with sunlight about 285 days annually. The stove, which costs 80 rupees or about $16.80, is expected to save the government of India about $42,000,000 each year in foreign exchange used now to buy kerosene and stoves from other countries. And the natives are jubilant â€”they save on fuel bills, there is no flame and hence no danger of fire, there is no smoke and hence no discolored walls and there are no ashes and hence no troubles about cleaning. The stove is certainly ingenious and a milestone in progress, but for some- thing truly amazing consider the scientific bombshell exploded only a few months agoâ€”the creation of the world’s first solar batteryâ€”first successful device to convert useful amounts of the sun’s energy directly and efficiently into electricity! This remarkable device was developed at the Bell Telephone Laboratories in Murray Hill, N. J., by a team of three scientists, Gerald L. Pearson, Calvin S. Fuller and Daryl M. Chapin. Even as presently constituted, they ‘ pointed out, it is vastly superior to the recently developed atomic battery as a source of fuel power. The latter produces only one millionth of a watt of energyâ€”the sun device can deliver power at the rate of 80 watts a square yard of surface. It has been improved, too. When first announced last April, the battery had achieved what scientists call a six per cent efficiency in converting sunlight directly into electricity. Other photoelectric devices have never been able to get above one per cent. By October, however, Bell experts created cells which yielded a record eight per cent, comparable to those of steam and gasoline engines. Moreover, nothing is consumed or destroyed in the energy conversion process, and there are no moving parts, which means that the battery should last indefinitely. The sun battery is actually an amazingly simple apparatus using strips of silicon about the size of razor blades. These wafers are linked together to deliver power from the sun. The key to the technique lies in the special treatment Bell scientists give to the silicon wafers. First they remove all the impurities in ordinary silicon, then carefully introduce a foreign element into a microscopic layer near the surface. This renders the silicon disk extremely sensitive to light. Did you know that there are now a number of sun furnaces in full operation, heating, burning and melting for science ? The world’s largest is atop Mont-Louis, in the French Pyrenees, and was established not long ago by the French Government. An ancient fortress was * converted into a modern solar energy laboratory and the sun furnace, which can produce an intense heat of 5,432Â° F, was installed. The apparatus consists of two enormous mirrorsâ€”one a stationary parabola with a 105-square-yard surface, the other a larger flat mirror that follows the sun like a mechanical sunflower and reflects its rays directly into the parabola. The parabola reflects these incoming rays to a single focus. Consequently, the sun energy is concentrated tens of thousands of times into a minute space. Intense heat results. The French solar furnace is doing important work in producing and studying a class of minerals called high refractories, which are prepared and fused at temperatures too high for ordinary mineralogical furnaces. America creates some pretty high temperatures on its west coast. Consolidated Vultee Aircraft Corp., for instance, operates a solar furnace at San Diego, Calif., and it’s quite a warm little thing in its own right. Convair is experimenting with metals to go into jet and rocket engines and in guided missiles, and it’s looking for substances which can stand more heat than any uncovered so far. This instrument has a 120-inch aluminum mirror formed into a parabolic reflector. The sun’s rays are collected and shot to a focal point about the size of a dime and this hot spot is hotter than an oxyacetylene torch at full blast. What’s the score on sun-heated houses? Again, science is farther along than you thought and again, some aspects are actually here already! Hear the authorities: A report by the President’s Materials Policy Commission estimated recently that there would be fully 13,000,000 solar-heated homes in America by 1975. Dr. Farrington Daniels, of the University of Wisconsin, a past president of the American Chemical Society, believes that the most promising immediate use of sun power lies in house-heating. R. S. Dill, chief of the heating and air conditioning section of the National Bureau of Standards, asserted not long ago that solar heating of homes has been satisfactorily demonstrated. Two houses with complete solar heating equipment have been built for experimental purposes by scientists of the Massachusetts Institute of Technology and show possibilities that are more than promising. One is located at Cambridge, Mass., and was constructed under the supervision of MIT’s Dr. Hoyt C. Hottel. It has four rooms and a sloping south roof covered by a glass-enclosed metal plate that acts as a heat collector. Water warmed by contact with this collector is pumped into a 1,200-gallon tank mounted in the attic. From there, the hot water is circulated throughout the house. There’s one drawback, howeverâ€”there isn’t always a uniform interior temperature. The second house at Dover, Mass., sought to hurdle this barrier. This dwelling has solar collectors on its vertical south wall. Warmed air is then circulated down to a basement bin filled with a compound called Glauber’s salt. The warm air melts the salt crystals and in so doing the latter absorb generous quantities of heat. Comes evening or a cool day, and the salt solidifies. As it does, it releases its stored heat into water, which circulates into the house’s radiators. The salt never needs to be renewed. What else do we already have? For one thing, the armed forces are using small solar stills in emergency equipment. These devices are on life-saving rafts and are designed to make salt water drinkable. And now just one final thing. Are you interested in elbowing into this vast field? Then listen: I asked Dr. Telkes of New York University what advice she had for those who wished to know more about solar energy. A good engineering course of study, was her reply. How about books on the subject? Dr. Telkes suggests these books and periodicals: Books: Energy In The Future, by Palmer C. Putnam, published by Van Nostrand Co., N. Y.; Energy Sourcesâ€”The Wealth Of The World, by Eugene Ayres and C. A. Scarlott, published by McGraw-Hill, N. Y.
Periodicals: Future Uses Of Solar Energy, in Bulletin Of The Atomic Scientists, Vol. VII, Nos. 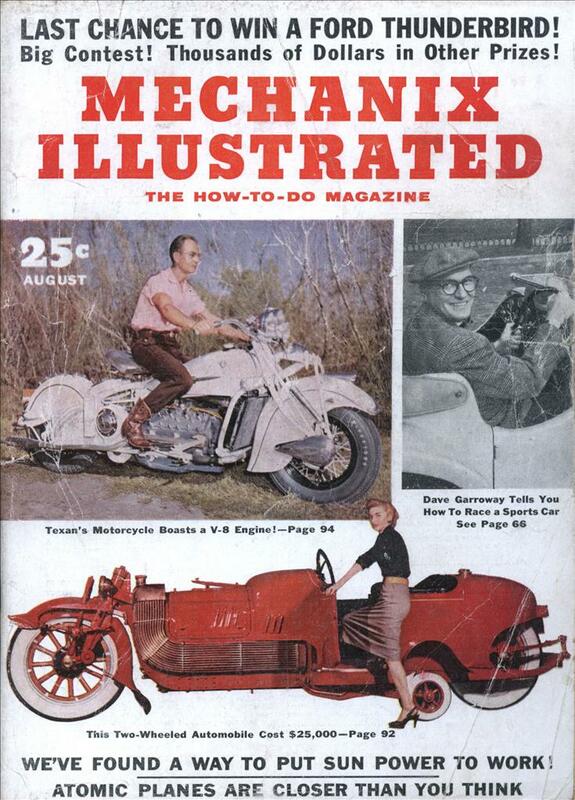 7 and 8, August 1951. Fresh Water From Sea Water By Solar Distillation, in Industrial And Engineering Chemistry. Vol. 45, May 1953. A Review Of Solar House Heating, in Heating And Ventilating, Sept. 1949. 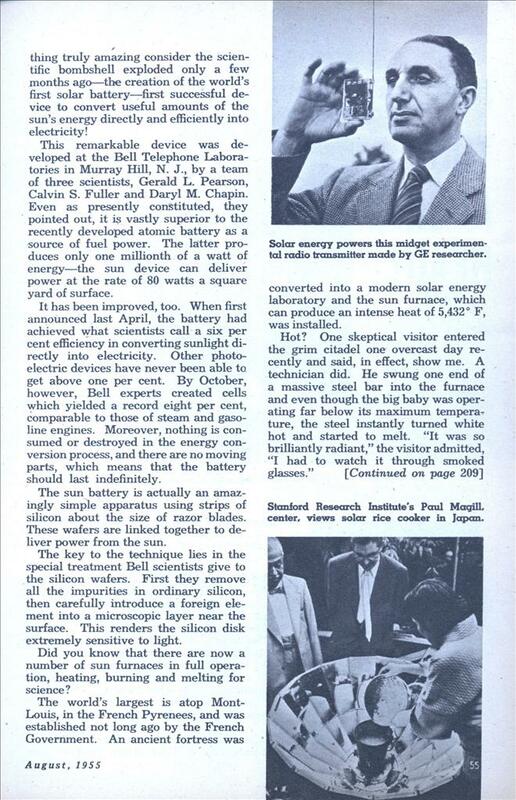 Space Heating With Solar Energy, in The Scientific Monthly, Dec. 1949. A complete bibliography on the uses of solar energy, Dr. Telkes asserts, has been prepared at the Stanford Research Institute in Stanford, Calif., and is now available. Dip into some of these and see what’s cooking with solar energy. You’ll find the fog is clearing away and the rays are shining throughâ€”rays, untamed until now, which will eventually provide mankind with limitless sources of energy. That’s why science, right now, is all hot and bothered about the sun. Screw flying cars and personal jetpacks, when is this going to happen?